Trail mix or gorp (good old raisins and peanuts) is the natural answer for what energy snack to take along on the trail. The nuts provide protein and salt replenishment while the raisins provide carbohydrates for fuel. Often, commercially prepared trail mix also has chocolate chips or candies. Trail mix doesn't need any refrigeration and is food-safe for weeks, perfect for walking, trekking, and hiking. While you can buy pre-packaged trail mix, it is cheaper to make your own, and the recipe is very simple. The ingredients are easy to find in the bulk bins at the supermarket, and you can create the mixture you enjoy the most. Trail mix is energy-dense, with lots of calories in a smaller portion, reducing the weight you need to pack along to get the replenishment you need. But that also means you need to use portion control so you don't end up eating too many calories. Basic trail mix is high in sugar and fat, which will give you quick energy as well as sustained energy. 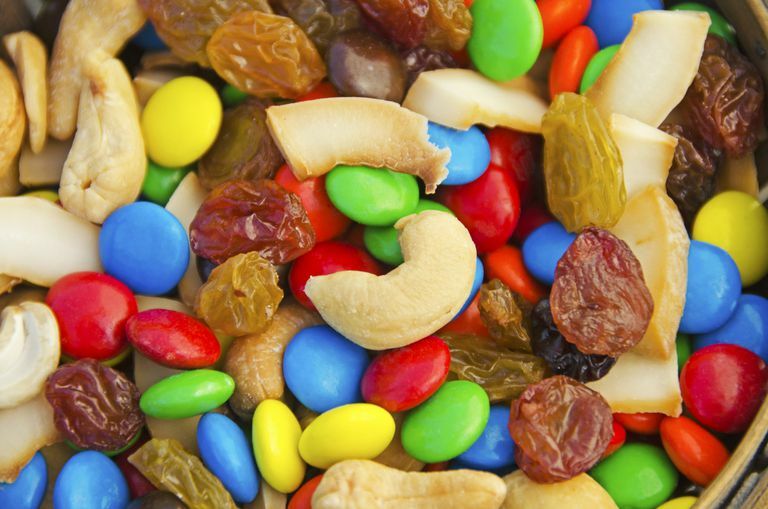 On average, trail mix has 131 calories, 4 grams protein, and 8 grams fat per ounce. A cup of trail mix has 693 calories, 21 grams protein, and 44 grams fat. Trail mix with chocolate chips has a few more calories, which come mostly from fat. On average, it has 137 calories per ounce, with 4 grams protein and 9 grams fat. One cup has 707 calories and 47 grams of fat. The classic trail mix gorp recipe calls for equal parts of nuts and various dried fruits. This example makes a 3-cup batch of trail mix and keeps the proportions easy with a cup of each. You don't need to get out the measuring cup—any mug will do to mix equal parts. While you could use chocolate chips, M&Ms are preferred because they won't melt in your pack or pocket. Salted peanuts provide the needed salt replacement for exertion. Mix and portion out. If you are watching your calories, you may want to weigh it out into single-servings in plastic bags to take along so you can ensure you don't eat too much at one time. You can adjust the proportions to taste. You don't have to stop at good-old-raisins-and-peanuts, with or without chocolate chips or chocolate candies. Have fun browsing the bulk bins at the grocery store and finding different nuts, dried fruit, candy, and salty snacks you can add. The overall cost is likely to be less than pre-packaged mixes as well. Dried fruit: Raisins, dried apricots, date nuggets, banana chips, apple chips, dried papaya, dried cranberries, dried cherries. You can substitute these for the raisins in the basic recipe, or add them as a separate ingredient. Nuts and seeds: Peanuts, almonds, cashews, hazelnuts, sunflower seeds, pumpkin seeds, and more. Consider smoked or spicy nuts for extra flavor. Chocolate: M&Ms, chocolate chips, white chocolate chips, carob chips, dried coconut, Reese's Pieces. Salty Stuff: Pretzels, sesame sticks, oriental rice crackers, salty "party mix" cereal. Cereals: Any breakfast cereal or granola. Trail mix is meant to be calorie-dense, so it needs to be strictly portion-controlled if you are on a reduced calorie diet. If you are on a low-carb diet, you need to consider ways to make low carb trail mix. Unsweetened coconut can be a better choice over dried fruit if you are trying to reduce carbs, or find a dried fruit that has no added sugar and use less of it in proportion to nuts and seeds. If you are allergic to nuts, you will need a nut-free trail mix, substituting safer sunflower seeds or pumpkin seeds for the nuts. While traditional gorp is gluten-free, you will need to scrutinize any prepared trail mix to ensure it is safe on a gluten-free diet and doesn't include granola, pretzels, or ingredients that may be cross-contaminated in processing. Basic Report: 19059, Snacks, trail mix, regular. USDA National Nutrient Database for Standard Reference Release 28. https://ndb.nal.usda.gov/ndb/foods/show/6097. Basic Report: 19062, Snacks, trail mix, regular, with chocolate chips, salted nuts and seeds. USDA National Nutrient Database for Standard Reference Release 28. https://ndb.nal.usda.gov/ndb/foods/show/6099.